Area where Ripuarian is spoken. Green = sparsely populated forest. Central German language area after 1945 and the expulsion of the Germans from the east. 1 = Ripuarian. Ripuarian (/ˌrɪpjuˈɛəriən/; also Ripuarian Franconian; German: Ripuarisch, ripuarische Mundart, ripuarischer Dialekt, ripuarisch-fränkische Mundart, Ribuarisch) is a German dialect group, part of the West Central German language group. 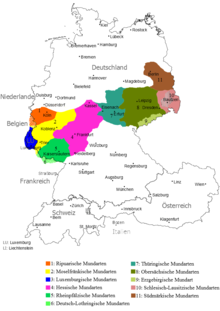 Together with the Moselle Franconian which includes the Luxembourgish language, Ripuarian belongs to the larger Central Franconian dialect family and also to the Rhinelandic linguistic continuum with the Low Franconian languages. It is spoken in the Rhineland south of the Benrath line — from northwest of Düsseldorf and Cologne to Aachen in the west and to Waldbröl in the east. The language area also comprises the north of the German-speaking Community of Belgium as well as the southern edge of the Limburg province of the Netherlands, especially Kerkrade (Kirchroa). The name derives from the Ripuarian Franks (Rheinfranken), who settled in the area from the 4th century onward. The most well known Ripuarian language is Kölsch, the local dialect of Cologne. 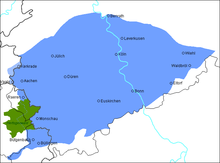 Dialects belonging to the Ripuarian group almost always call themselves Platt like Öcher Platt (of Aachen) or Eischwiele Platt (of Eschweiler), Kirchröadsj Platt (of Kerkrade) Bocheser Platt (of Bocholtz) or Bönnsch Platt (of Bonn). Most of the more than one hundred Ripuarian dialects are bound to one specific village or municipality. Usually there are small distinctive differences between neighbouring dialects (which are, however, easily noticeable to locals), and increasingly bigger differences between the more distant dialects. These are described by a set of isoglosses called the Rhenish fan in linguistics. The way people talk, even if they are not using Ripuarian, often allows them to be traced precisely to a village or city quarter where they learned to speak. About a million people speak a variation of Ripuarian dialect, which constitutes about one quarter of the inhabitants of the area. Penetration of Ripuarian in everyday communication varies considerably, as does the percentage of Ripuarian speakers from one place to another. In some places there may only be a few elderly speakers left, while elsewhere Ripuarian usage is common in everyday life. Both in the genuine Ripuarian area and far around it, the number of people passively understanding Ripuarian to some extent exceeds the number of active speakers by far. Estimates assume some ten, and up to twenty million speakers. Speakers are centred on the German city of Köln (Cologne). The language's distribution starts from the important geographic transition into the flat-lands coming down from the Middle Rhine. The Ripuarian varieties are related to the Moselle Franconian languages spoken in the southern Rhineland (Rhineland-Palatinate and Saarland) in Germany, to the Luxembourgish language in Luxembourg, to the Low Franconian Limburgish language in the Dutch province of Limburg, and to Low Dietsch in the province of Liège, Belgium. Most of the historic roots of Ripuarian languages are in Middle High German, but there were other influences too, such as Latin, Low German, Dutch, French and Southern Meuse-Rhenish (Limburgish). Several elements of grammar are unique to Ripuarian and do not exist in the other languages of Germany. Belgium and the Netherlands officially recognise some Ripuarian dialects as minority languages, and the European Union likewise follows. m. / f. / n.
^ Hammarström, Harald; Forkel, Robert; Haspelmath, Martin, eds. (2017). "Ripuarian". Glottolog 3.0. Jena, Germany: Max Planck Institute for the Science of Human History. ^ a b Grammatik der ripuarisch-fränkischen Mundart von Ferdinand Münch. Bonn, 1904, p. 8ff. & p. 159f.